Canvas upper covered in eye-catching crushed glitter. 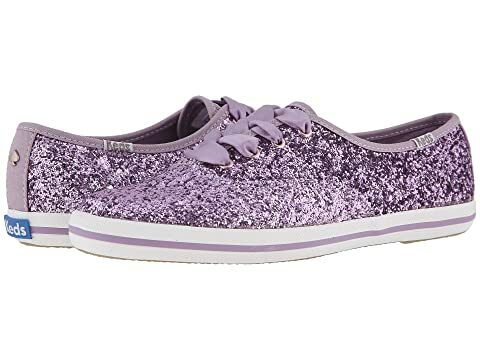 We can't currently find any similar items for the Champion by Keds x kate spade new york. Sorry! A ridiculously adorable, yet practical, shoe choice! Whether you are attending a Christmas soirée or a New Years Eve gala this sneaker has you covered. I wore it for our holiday gatherings since I was gimping around on crutches. Everybody ranted and raved about my shoes and never even noticed my crutches! I would have to say that is a win! My mother-in-law ordered a pair as soon as she saw them! I think everybody should own at least one pair! I think I may splurge on a rose gold pair before you know it! I love the Kate Spade sneakers. I hesitated on getting the glitter, but it in black it is suble. I wear it as a fun Florida shoe. I took my normal Kate Spade sneaker size, which is 71/2. (I am either a 7 or 71/2 in shoes.) These are perfect for leggings or jeans. Bought this pair for my 84 year old mother. They run a little narrow, but otherwise the fit was great. These shoes are a showstopper. They were so cute that I bought myself a pair. Purchased these to wear at my son's wedding, after I took my heels off! They were terrific!! Fun and stylish and a really conversation starter. The Kate Spade name and the sparkles really glammed things up. They did seem a half size larger so I would order down. Bonus: they are fun with jeans, too!! Ordered these to wear at a wedding reception (after taking off my sparkly heels) CUTE! Lots of compliments as they are fun. VERY SPARKLY!! The bride wore the same shoe too!! Post wedding wearing them too! !